World leaders have paid tribute to former German chancellor Helmut Kohl, who oversaw German reunification. Mr Kohl, who died last month, was a major driving force behind closer European integration. 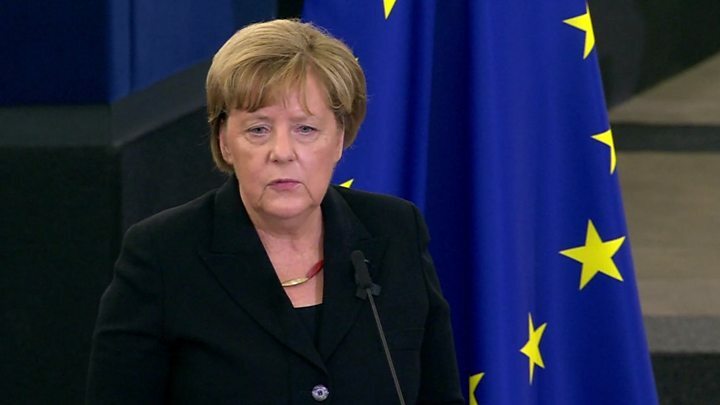 Speaking next to his coffin, which was draped in the EU flag, Chancellor Angela Merkel said it was up to this generation to preserve his legacy. His remains travelled down the Rhine river to the German town of Speyer, where he was buried. It is the first time that the European Parliament in Strasbourg has paid tribute to a leader in such a way. Mr Kohl worked for German reunification as others hesitated, Mrs Merkel said, adding that his motivation was always that there should be no more war in Europe. "Now it's up to us to preserve your legacy. I bow before you and your memory in gratitude and humility," she said. She also offered personal thanks for the opportunities that Mr Kohl - her political mentor whom she later denounced over a funding scandal - had given her in her career. 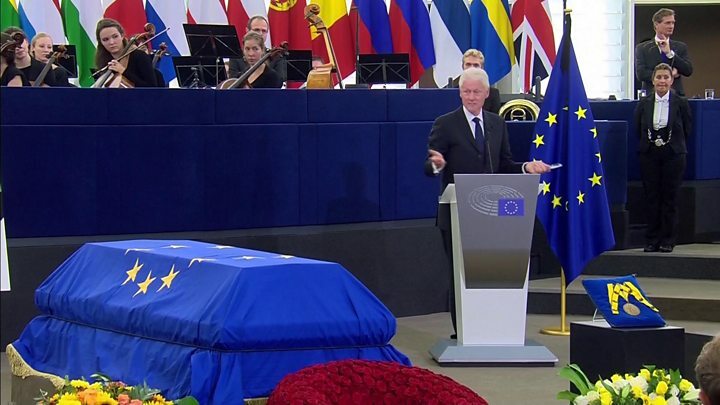 Former US president Bill Clinton also delivered a eulogy. "All of us who came - why? Because Helmut Kohl gave us the chance to be involved in something bigger than ourselves. Bigger than our terms of office, bigger than our fleeting careers," he said. Other speakers included French President Emmanuel Macron, Russian Prime Minister Dmitry Medvedev and former Spanish Prime Minister Felipe González. This was the first ever occasion of its kind: in essence, a European state funeral. And though in essence it was sad, it was also - certainly for believers in the European ideal - uplifting. That is because talking about Helmut Kohl is a chance to contemplate history, and to remember the forces that changed the face of Europe in the 1990s. Chief among those forces was the sense of shared European ambition that the Chancellor embodied. As more than one of the speakers in the European parliament said, Helmut Kohl's genius when he reunified Germany was to spot the historical moment. In Bismarck's famous phrase, he "grasped the hem of God's mantle as he passed". That is precisely the Kohlian spirit that Emmanuel Macron (especially) wants to bottle. He senses the world is shifting once again, and that historic windows for Europe are opening. Like Kohl, he wants to be ready to act. The ceremony was proposed by European Commission President Jean-Claude Juncker, who was nicknamed "Junior" by Mr Kohl and who described him as a mentor and friend. More than 2,000 police were on duty in Strasbourg. However Germany did not hold a state funeral for Mr Kohl in Germany at the request of his widow Maike Kohl-Richter, his second wife. That decision was criticised by Walter Kohl, Mr Kohl's son by his first wife, who wanted a farewell ceremony near the Brandenburg Gate in Berlin, near the site of the former Berlin Wall. Walter Kohl has described the European Parliament commemoration as "unworthy" in an interview with German newspaper Die Zeit.